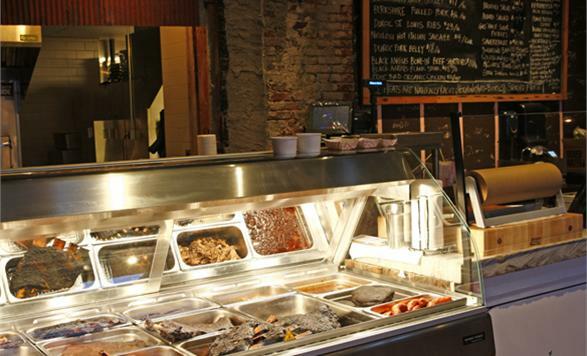 The menu changes daily, with a rotating selection of meats available for purchase by the pound. The sides are kept simple and include burnt end baked beans, broccoli salad, pickles, sauerkraut and potato chips. The drink list offers nine beers on tap, plus a cider, and an extensive list of North American bourbon and whiskeys. Picnic tables are the primary form of seating, giving the restaurant a communal atmosphere. The space has an industrial feel, with its reclaimed wood, cement floor and exposed beam ceiling. Fette Sau is a transplant to Philadelphia from Brooklyn by way of partnership between restaurateurs Stephen Starr and Joe Carroll, marking Joe’s first restaurant outside Williamsburg, Brooklyn.